María de San José Salazar (1548-1603) took the veil as a Discalced ("barefoot") Carmelite nun in 1571, becoming one of Teresa of Avila’s most important collaborators in religious reform and serving as prioress of the Seville and Lisbon convents. Within the parameters of the strict Catholic Reformation in Spain, María fiercely defended women’s rights to define their own spiritual experience and to teach, inspire, and lead other women in reforming their church. María wrote this book as a defense of the Discalced practice of setting aside two hours each day for conversation, music, and staging of religious plays. Casting the book in the form of a dialogue, María demonstrates through fictional conversations among a group of nuns during their hours of recreation how women could serve as very effective spiritual teachers for each other. The book includes one of the first biographical portraits of Teresa and Maria’s personal account of the troubled founding of the Discalced convent at Seville, as well as her tribulations as an Inquisitional suspect. 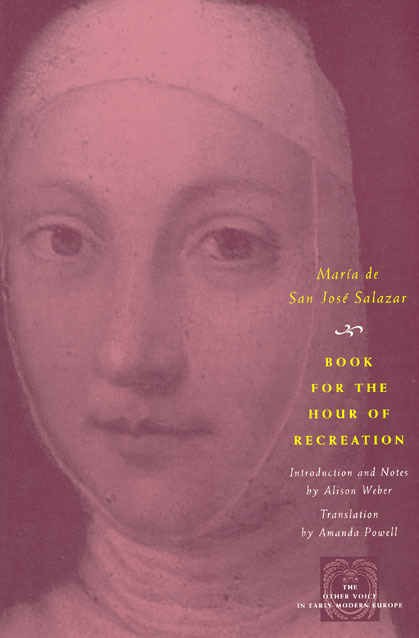 Rich in allusions to women’s affective relationships in the early modern convent, Book for the Hour of Recreation also serves as an example of how a woman might write when relatively free of clerical censorship and expectations. A detailed introduction and notes by Alison Weber provide historical and biographical context for Amanda Powell’s fluid translation.